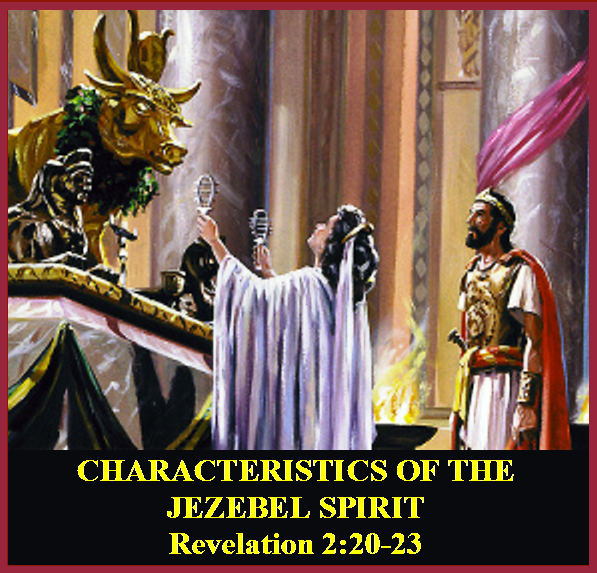 The spirit of Jezebel is one of the dominant evil authorities over our world. Our society, the church, families, and individuals have been personally attacked, infiltrated, sabotaged, and robbed by Jezebel. This spirit works in both women and men and she is no respecter of persons. There are two types of people: First, those who are attacked by Jezebel and second those with a Jezebel spirit who are always seeking to be the center of attention. One of the last letters to the churches strongly addressed the subject of tolerating the Jezebel spirit. Revelation 2:20-23 gives a clear picture that it leads astray the best of servants into wrong teachings and immorality. Jesus, through John in the Book of Revelation, gives a strong warning of judgment on the Jezebel spirit. The reason for the warning is that the Jezebel spirit seeks to destroy true worship. It misleads and corrupts the church and seeks to neutralize the life of God appointed leaders, pastors, and other male authority, by any means – sexual enticement, discouragement, etc. Jezebel is out to destroy the families, harmony and God-ordained authority. It is the spirit behind disorder in churches and families, in the feminism movement, sexually immoral lifestyles, and the abortion movement. JEZEBEL’S ULTIMATE GOAL IS ALWAYS CONTROL AND THE DESTRUCTION OF TRUE, HUMBLE AND CHRIST CENTERED WORSHIP. A Jezebel spirit seeks control through manipulation. It has a deep hatred of true spiritual authority, and uses emotional pressure and sensuality in its pursuit of power. It uses subtle persuasion to gain influence and get close to those in control. It then uses this position to gradually dominate. The Jezebel spirit is always motivated by its own agenda and pride and relentlessly pursues selfish recognition. It is intent on getting what it wants. There may be one in every ministry of the church and every family, trying to dominate, arrange, and selfishly control everybody. Jezebel likes to be seen close to leaders, and use their influence. She likes to use the power and influence of others to accomplish her goals and control her environment. In 1 Kings 21:8 we read “Jezebel wrote letters in Ahab’s name and sealed them with his seal, and sent them to the elders and nobles of the city.” This is typical of Jezebel, because, she prefers to remain concealed in the background, while she manipulates situations and leaders. This demon spirit is very crafty, cunning, and seductive; more than many of the other types of demons are. It will thus be capable of playing more than one type of game with you. There is a charismatic and domineering energy in the person possessed the Jezebel spirit. People with a Jezebel spirit have never been born again and had their lives transformed by the cleansing blood of Christ and the indwelling Holy Spirit. They are religious but not righteous. The ultimate goal is always the control of people, of the church and to corrupt the ministry. They attack leadership, openly and behind their backs. They are jealous of godly church leaders; they complain when they are not the center of attention and things are not done the way that they want them done. They cause fear, discouragement and disharmony; and they try to be a dominating leader and the center of attention. They are deceptive, subtle, manipulative, spoiled, proud, independent, rebellious and self centered. They have a proud, religious spirit; their family life is out of order, their home is not a place of peace, humility and holy living. A weak leader like Ahab will permit the Jezebels to be in control and dominate the church and others. If a person with a Jezebel spirit infiltrates a prayer group, a music group or a Bible study class, they will try and work their way to the top so they can be the leader of the group and run it their way, teaching falsehoods and doing much harm wherever they infiltrate. Beware, as the warnings are severe in Revelation 2:20-23. How can someone that has the spirit of Jezebel be a Christian? Jesus warns the Church of Thyatira “The Corrupt Church” I have a few things against you, because you allow that woman Jezebel, who calls herself a prophetess, to teach and seduce My servants to commit sexual immorality and eat things sacrificed to idols. 21 And I gave her time to repent of her sexual immorality, and she did not repent. 22 Indeed I will cast her into a sickbed, and those who commit adultery with her into great tribulation, unless they repent of their deeds. 23 I will kill her children with death, and all the churches shall know that I am He who searches the minds and hearts. And I will give to each one of you according to your works. As we see from God’s Word, Jezebel was unwilling to repent. “Repent” means to change our mind and direction from following our way to following God’s way, from sin and its disastrous consequences (hell for the unsaved) to God and eternal life. In His mercy, God has given us time to decide to follow Him but the Jezebel spirit did not and does not; therefore they are not born again because they choose to follow their god – Satan, who is the archetype of the Jezebel spirit and will end up in the Lake of Fire along with their master. This evil spirit has been responsible for not only tearing down churches, pastors, and different Christian ministries, but it has also been responsible for breaking up many marriages, friendships, companies, along with getting many people to commit cold-blooded murders as we see in 1 Kings 21:1-16. I hope this will answer your question. Blessings to you also.